Investing in women. Advancing opportunities. When addressing the issue of gender equality, it’s appropriate to do so in the context of amfori members’ three biggest sourcing countries. Women make up between 70-90% of garment workers in China, India and Bangladesh. 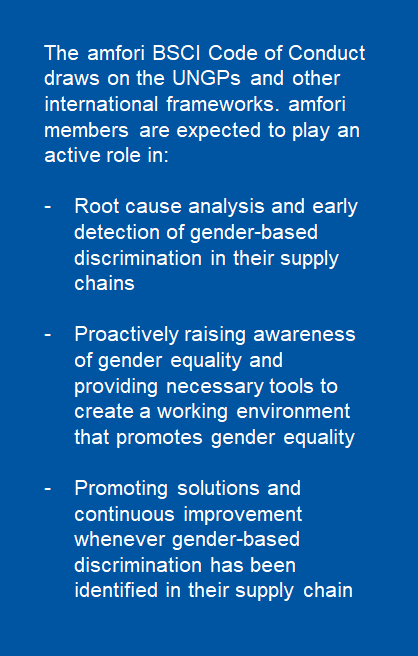 Despite such a dominant presence, they are disproportionately represented at the lowest tiers of the supply chain and subject to the worst kinds of discrimination and abuses. Research consistently finds that large percentages of women have been intimidated or threatened with violence, and in the worst cases raped or forced to commit a sexual act. Inadequate or non-existent grievance procedures heighten the fear many have of speaking out. Such findings are a stark reminder of the challenge businesses face in rooting out human rights risks in global supply chains. Regulations to combat gender-based discrimination are in place in some countries, but a lack of enforcement and awareness can limit effectiveness. Each country represents a unique myriad of social and historical reasons for gender inequalities, but the negative effects on women and broader society are largely the same. Business has a responsibility to respect human rights. 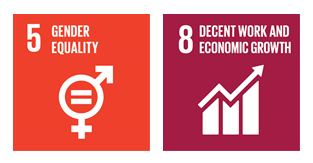 The UN Guiding Principles on Business and Human Rights outline the measures businesses should incorporate into their due diligence practices, including how to address gender-related issues. Respecting human rights is not just about doing no harm, it’s about giving people access to the fruits of development. Any form of discrimination is a serious barrier against such access. And that’s why gender inequality fundamentally comes back to respecting human rights. In doing so, businesses are promoting the rights of women and supporting the sustainable development of communities. The business case: what’s possible? The positive impact also goes far beyond the workplace. Women have been shown to invest 90% of their income into their families and communities, making the potential developmental effects of their empowerment exponential. Since mid-2017, amfori has spoken out on issues specifically involving gender-equality and have been developing a number of partnerships that culminated in our Women’s Empowerment Programme. The programme currently consists of two projects and one research partnership. In India, we signed an agreement with the Confederation of Indian Industry (CII) to initiate a one-year project to reduce workplace violence. The project will focus on improving workers’ and supervisors’ awareness of labour rights and grievance mechanisms, with a focus on sexual harassment. The project also envisages general awareness raising activities on legislative requirements as stipulated by the ‘Sexual Harassment of Women at Workplace (Prevention, Prohibition and Redressal) Act (2013) and the ‘Maternity Benefit (Amendment) Act (2017)’. In Bangladesh, we’re partnering with CSR Centre and DBL Group to train management and female factory workers in six amfori BSCI factories across Dhaka and Chittagong. The project, titled the Shobola Project, will train female workers, empowering them to advance their careers beyond the factory floor, and raise worker and management awareness on gender-related issues, sexual harassment and discrimination. In China, we have partnered with International Organization for Migration (IOM) to conduct a research project in order to understand the situation and needs of female migrant workers. Internal female migrant workers in China face a range of vulnerabilities and challenges, from human trafficking to labour exploitation. The challenges also encompass limited or lack of access to parental leave and child care, medical and health services and occupational health and safety, legal assistance and work-life balance. Join amfori. Be part of the open and sustainable trade community.